Record Time & yay for ME!! This is a tribute to Varna who’s been just a god-send for about a year now. We both taught at St Laurence’s (she’s still there) and we just clicked. Same devilish sense of humour, same work/love/life ethic and same ability to knock over a few bottles of bubbly….only problem is – she LOVES Chardonnay and I HATE Chardonnay which makes choosing a bottle to share over dinner really interesting if you’re eaves-dropping!! The staff at Liquorish used to chuckle more than once over our negotiations. On closer inspection, Just about everything on the layout is old stash, except for the iron-ons and gem brads which were on BIG sale at Scrap City. Took me about an hour – okay, half an hour, to do all the Heidi Swapp iron-ons but will know better next time. I think Rachel Axton did something similar months ago in a mag (can’t remember which) with the red boy ones and thought that was a great idea. ALSO…… won a prize for the 123 Monthly for March. Remember this layout?? From memory the criteria was black and white with one other colour, stitching and 3+photos. I really, really love bold coloured cardstock. Just brings layouts to LIFE!! Nearly forgot about it because I’ve been a lazy blog-friend the last couple of weeks. The lovely Sonia at Forever Always is sending me a SURPRISE in the mail. Can’t wait. 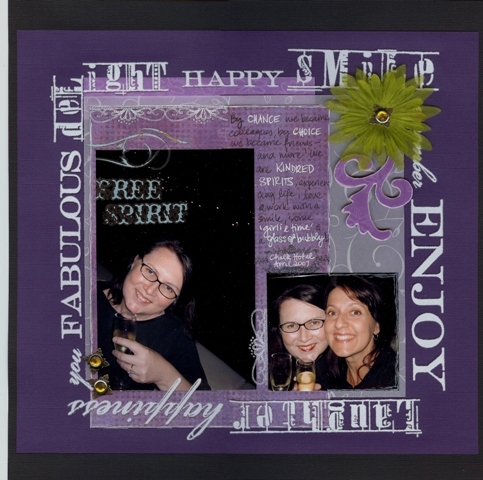 Previous: Chalk n Talk n talk n scrap n cry…..
Hey Giovanna, Love this LO for the April 123 challenge – so if there’s no paint how did you get your chipboard such a cool colour? And are all the words around the outside rubons … or?? ?See you at Divas …Helen.